Follow us on Twitter for up-to-the-minute updates on the sales that just can’t wait. You can also subscribe to our newsletter, follow us on Facebook, and join their community driven Facebook deal-finding group for the web’s best deal coverage all year ‘round. 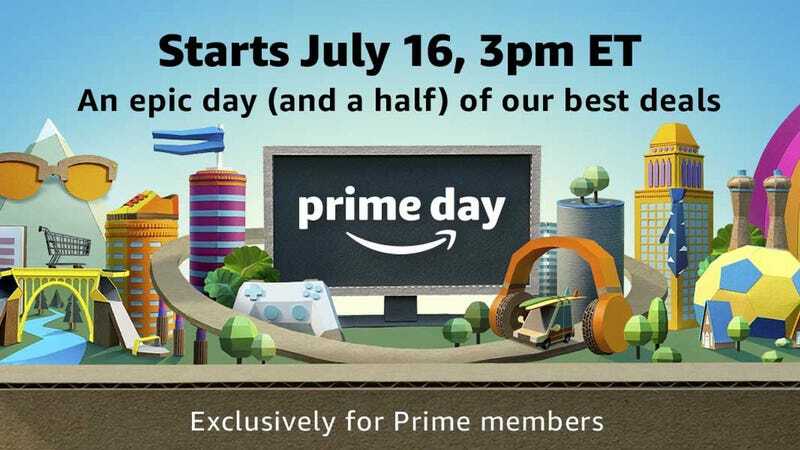 Prime Day officially kicks off at 3PM ET today, but Amazon went ahead and put their own devices on sale early to kick off the festivities. If you’ve had any Amazon devices on your wishlist, the deals are honestly pretty spectacular. A lot of products are legitimately 50% off for the first time (a 4K Fire TV for $35, are you kidding! ), and others, like the $80 Kindle Paperwhite, $100 Echo Spot, $30 Fire Tablet, and $290 50" 4K Fire TV are down to the best prices we’ve seen, with extra savings available in many cases if you buy multiples of the same product. Unsurprisingly with the success of Alexa, a number of smart home products round out the sales, including 50% off Amazon’s home security camera (just $60), $75 off Amazon’s newly acquired Ring Doorbell Pro, and a number of bundles that include smart home gear with an Alexa device that can control it. You can find all of the deals in this post here, but just remember, they’re only available for Prime members. You might have seen this 200GB microSD card as part of Amazon’s SanDisk Prime Day savings, but it bears a special callout now, because it just got a couple bucks cheaper than it was yesterday, which was already an all-time low price. $44 is an absurdly good price for a Switch-compatible memory card with this much space, but we don’t expect it to last long. Update: Temporarily out of stock, but still orderable at this price. Amazon will ship it to you once they get more in. ~$30 would be a great price for a 128GB microSD card. $24 though? That’s totally unprecedented. If you need more storage space for your action cam, your new Fire tablet, or a Nintendo Switch, this could be the best deal of Prime Day. Nope, that’s not a mistake: This is a 1TB SSD for $150, which is about as cheap as we’ve ever seen one of these, and easily the best deal we’ve seen on one from a name brand like SanDisk. iOttie makes some of best smartphone dash mounts around, and you can drive away with some of the best deals we’ve ever seen on their wares during Prime Day. The highlights of the sale are the wireless mounts, which use Qi charging to juice up your phone without dealing with a wire. In my opinion, it’s the single greatest use case for wireless charging, and you have three different mounts to choose from today, all of which normally sell for $50. Sugru is right up there with binder clips and the Raspberry Pi in Lifehacker’s pantheon of must-have gear, and you can stock up today with eight packs from Amazon for just $16, for Prime members only. Unlike most Sugru deals, this one’s available for every combination of colors Amazon sells, at least as of now. Amazon’s Prime Day “PC” sale is really just a catch-all for a bunch of tech products, so let’s dive into the highlights, shall we? As far as I’m concerned, the star of the show is Samsung’s 28" 4K display for an all-time low $249. If your computer can drive it at 60 Hz, it’ll be a massive upgrade over the 1080p display that you’re probably looking at right now. Home network not getting the job done? You can grab the reader favorite Google Wifi mesh routers for $99 each, a complete Netgear Orbi mesh networking system for $220, or a barebones-but-effective TP-Link Archer C9 for just $65. You can never have enough external hard drive storage, especially with a 2TB drive priced at $59, or 4TB for $86, both among the best prices we’ve ever seen for drives of those sizes. If you’re looking to build a PC from scratch, there are a lot of components included in the sale, the sexiest of which is probably a GTX 1060 graphics card for $180, which should give you a ton of bang for your buck. And of course, it’s a PC sale, so it wouldn’t be complete without some PCs. Several laptops are available, from the sleek and specced-out LG Gram to several inexpensive, Celeron-powered convertibles. Update: The 50" is sold out, but the $250 43" version is still available. Are Amazon’s new co-branded Toshiba Fire TVs the best sets you can buy? No, of course not, especially not with limited HDR support. But they’re extremely affordable, have 4K resolution, and include Amazon’s excellent Fire TV software and an Alexa voice remote. For some buyers, or for certain rooms in your house, that’s more than enough. If you think they’ll fit your needs, you can get the 43" for just $250 (down from $300-$330), or the 50" for $289 (down from $400) during Prime Day. I wouldn’t be surprised if these sold out early though. They aren’t Sony’s best noise canceling Bluetooth headphones—that honor goes to the $300 WH1000XM2s—but these wireless over-ears are still a fantastic deal for $98, or $50-$100 less than usual. The WH-CH700Ns run for up to 30 hours in wireless noise canceling mode, or you can plug them in with a 3.5mm cord to extend that to 50 hours. If you travel a lot, or just work in a noisy office environment, this is a sound investment. Amazon isn’t generally known as a great place to buy Apple devices, but this is Prime Day, and all bets are off. While they last, a bunch of MacBook and MacBook Pro models (skip the Airs, in my opinion) are marked down, starting at $990 for a 2016 12" MacBook, which is my work computer. None of these are the latest and greatest—it seems that the most recent options are from 2016—but most MacBook updates since have been pretty iterative, and you stand to save a lot of money here. If you’ve had your eye on the excellent Galaxy S9 and S9+, Prime Day’s the day to finally pull the trigger. You’ll still pay the standard $720 for the S9, or $840 for the S9+, but the sheer volume of bonuses Amazon’s throwing in is pretty stunning. When you buy either phone, you’ll get an Echo Spot ($100 right now, usually $130), an Echo smart speaker ($70 right now, usually $100), and a Samsung SmartThings home monitoring kit, which itself includes four smart home accessories. Even on sale, those accessories would set you back a combined $330, and you’re getting them for free with the purchase of a great phone. $25 Amazon Gift Card + $5 Bonus Credit | $25 | Amazon | Prime members only. Add code to your account here before purchasing. If you’re a Prime member, you can get yourself a bonus $5 Amazon credit card when you buy a $25 gift card right now for Prime Day, with basically no restrictions. Why wouldn’t you do this? Go do this. Just click the button to add the code to your account, then go add a $25 physical or digital gift card to your cart. You’ll receive the $5 bonus credit within two days, and it must be spent by September 2. There’s no such thing as owning too much flash storage, especially at Prime Day prices. A bunch of SanDisk SD cards, flash drives, and SSDs are included in the sale, including the best price ever on a 400GB (!!) microSD card that could hold a lot of Nintendo Switch games. Yi makes our readers’ favorite budget action cam, and some seriously popular (and inexpensive) home security cameras, and their Prime Day deals don’t disappoint. The $29 IP camera (or $110 four-pack) is an obvious highlight, but the 5.7L 360 VR camera is the most exciting product of the bunch, especially at $120 less than usual. The new Tile Sport and Tile Style are basically the same product save for the names and color schemes, and that’s a good thing! They’re the same Bluetooth gadget finders you know and love, but water-resistant, ruggedized, and with a Bluetooth range of up to 200 feet, double that of their predecessors. Prime members can get one of each for just $35 today, or $10 less than the usual cost of a 2-pack. The past few years has seen a welcome deluge of Wi-Fi router innovation, and Portal is one of our readers’ favorites, particularly for smaller dwellings in congested, urban environments. Portal normally sells for about $130, but Prime members can grab it today for just $110, an all-time low. I bought this thing a couple of years ago, and absolutely love it. Against all logic and reason, Razer’s first attempt at a smartphone is actually extremely good, and it’s on sale for the first time ever for Prime Day. Its 120 Hz display refreshes twice as often as most phones’, meaning animations are super smooth, whether you’re playing games or just browsing Instagram. $525 is still a pretty penny for an Android phone, but that’s $175 less than usual, and an all-time low. It wouldn’t be Prime Day without all-time low prices on some Anker products, and you’ve got a lot to choose from today across a variety of categories. There are too many deals to list here, but we’ve collected them all over on this post. Need a bunch of extra storage for your PS4, Xbox One, or PC? This 4TB external drive from WD doesn’t require an extra power cord, and it’s marked down to just $96 for Prime members right now. It even includes both USB-C and USB-C cables, so you can plug it into just about anything. eBay’s taking on Prime Day with a major sales event of its own, no membership required. A few of our picks are broken out below, but you can see all of the deals over on this hub page. Amazon aficionados know that the company sells lightly used products at significant discounts under its Amazon Warehouse brand, and to Prime Day, you can save an extra 20% at checkout. Tons of categories are included in the sale, including computers, TVs, kitchen appliances, and cameras. Just find an Amazon Warehouse listing of an eligible item, add it to your cart, and you should see an extra 20% discount at checkout, on top of the already-discounted price you got for buying used. Most products tend to only have a handful of Warehouse listings though, so go cross a few things off your wish list before the good stuff is all gone. You score 20% off pretty much everything on Rakuten today (with a max discount of $50). That includes 12-month Xbox Live memberships, Dyson cordless vacuums, Logitech’s MX Anywhere mouse, and much, much more. Just remember, you’ll have to create or sign into an account and enter promo code SAVE20 at checkout.They’re running a separate sale for just sports and fitness equipment, like Camelbak hydration packs, tents, sports team gear, and more. Just enter GETFIT20 at checkout. There are a few things going on here, so head over to this post to learn more. Unless you live in a very large house, Dyson’s V8 cordless vacuum is probably the only vacuum you need. While it lasts for Prime Day, you can get the Absolute model for an all-time low $365, or over $100 less than usual. The Absolute features the longest battery life in the V8 line, and comes with the most accessories. If you don’t already own a Dremel, I will be personally affronted if you don’t take advantage of this Prime Day deal. The Dremel 4000-2/30 includes 160 accessories and a flex shaft attachment, and is down to an all-time low $74 today. For context, it usually sells for $133, and hasn’t dipped below $109 all year. Even if you don’t have any immediate projects that call for it, you can at the very least use it to make a mean Jack-O-Lantern in the fall. Whether you’re starting your Philips Hue collection or just adding some extra bulbs and accessories, Prime Day is chock full of great deals. Just note that some of them won’t show the discount until you get to checkout. The Ninja Professional BL610 blender is slightly less powerful than the 660, which readers voted their favorite, and it doesn’t include the single-serve blending cups, but at an all-time low $50, it’s a fantastic deal. I don’t mean to alarm you, but you’re probably pooping all wrong. Luckily, there’s an easy solution: Squatty Potty, marked down to $15 today, after applying a 30% Prime Day discount and a 10% clippable coupon at checkout. Squatty Potty is designed to lift your legs into an ideal bowel movement position, and according to Amazon reviewers at least, it really works. I can’t really overstate how popular popular this thing has been with our readers over the past year or so, and discounts of this size are pretty rare, so it’s time to purchase or get off the pot. Coffee Gator’s popular coffee accessories are getting in on the Prime Day fun today, with savings available on airtight containers, pour-over makers, kettles, and more. Chances are, there’s something in here to fit your kitchen’s decor. These prices will be gone by the end of the day, so don’t sleep on them. Fried foods are delicious. Fried foods will kill you. These are the laws of our cruel existence. This normally-$100 Power AirFryer attempts to break this rule by producing fried-like crispiness using no oil at all. Are the results as delicious as the real thing? Probably not, but if you believe the reviews, it can come pretty damn close. It’s just $60 on Target right now, but you won’t see the final discount until checkout. Amazon’s is selling the Aeropressfor $22 today when you clip the $6.46 coupon. Unlike most products on Amazon, that price basically never moves, so if you’ve had your eye on this thing, I wouldn’t recommend waiting. While you’re at it, we highly recommend picking up a reusable stainless steel filter to go with your new toy. It’s only $8, and it’ll pay for itself over time. The Renegade Elite model gives you 380 square inches of cooking space, and $489 is a whopping $210 less than usual. Just remember to invite me over the first time you use it to smoke a brisket. Do you need a 200 pound ceramic kamado grill? Yes, yes I think you do. This Kamado Joe normally sells for $1100, but it’s down to $750 shipped for Prime Day. That $350 you saved will go a long way towards meats. You even get a five year warranty on anything metal, and a lifetime warranty on the ceramic, so this one should last you. Recent winner of our sheet set co-op, Target’s already affordable Threshold sheets just got even cheaper. You probably already own an Instant Pot, but Prime Day is a great opportunity to save on an extra inner cooking pot, so you can use your appliance two nights in a row without washing dishes. Yes, it’s a little thing, but it’ll make your kitchen experience meaningfully better. Spare pots don’t go on sale very often, so if you think you might want one, don’t miss out. Just note that Prime members will see the discount at checkout. Gift your pup this memory foam PetFusion dog bed from Amazon. It has an impressive 4.7 stars and over 1,600 reviews, a removable, easy-to-wash cover, and all the sizes are discounted anywhere between $20 - $40. My dog tried it out a couple of months ago and it’s been one of her regular napping spots all summer long. I know we normally dismiss YETI products as overpriced, but at least for today, their Hopper Two 20 soft cooler is down to just $175, way down from its usual $250. This thing can hold about 18 cans at a 2:1 ice to can ratio, and keep everything cold for days on end. If you think you’ll need more space, the larger Hooper Two 40 is down to just $245 right now, which is a whooping $100 off. For slightly less than the cost of the 30 oz YETI tumbler, you can upgrade to this 64 oz one from Woot. It will keep your drinks piping hot or ice cold for pretty much a whole day. This sale will end at midnight or when the tumblers sell out, so grab this before it’s gone. Fill up your kitchen with these value sized boxes of Cheez-its, Pop Tarts, Rice Krispies Treats, and more from this Prime Day sale. They’re all 30% off and you can save a little more if you Subscribe & Save. As always, you can cancel your subscription after the first order ships. You’ll see the final discounted price at checkout. Rubbermaid Easy Find Lid 60-Piece Food Storage Container Set | $22 | Amazon | Prime only. Discount at checkout. These containers csome in six different sizes, and yet you only have to deal with three different lids, making it much easier to find the right one. The 60 piece set is on sale for just $22 today for Prime members (discount shown at checkout). You can thank us later. Amazon’s probably not the first place you’d go to buy appliances, but it might be worth checking out for Prime Day if you’re in the market for an upgrade. Several Kenmore washers, dryers, and electric ranges are on sale for Prime members, including free delivery and hookup. Wine fridges in this sale start at $419 and range up to $699 for a dual-zone, 66 bottle behemoth (down from $999). There’s also a $322 fridge designed for beer and soda cans, if that’s more your speed. There are a lot of inexpensive robotic vacuums out there, but Roombas are still the most broadly popular, not to mention the easiest to buy replacement parts and accessories for. This model looks very similar to the entry level 650, but with added Wi-Fi and Alexa support, and a great low price today for Prime members. Once you buy it, you’ll either spend a lot less time vacuuming, or you’ll quickly come to realize how dirty your floors usually are. Or maybe both! You could live your whole life cooking boxed Barilla pasta, and never once realize how fun and rewarding it can be to make your own. This Philips pasta maker isn’t cheap, but it lets you create your own noodles with multiple shapes in just 15 minutes. Prime members save an extra 20% at checkout, bringing it down to $208, so I’d call this deal <kisses fingers like an Italian chef> delizioso. Amazon’s incentivizing Prime members to try out their brands of grocery items like coffee, snacks, baby food, health items and more, by taking 30% off. I’ve tried the trail mix and it’s actually really good, plus it’s all really cheap today. You can get a 12 oz bag of coffee for just $6, a 90 count box of allergy medicine for $5, 30 day supply of vitamins for $10, and a whole lot more. So if you need to pick any of these items, you might as well save a little money and buy them from this sale. If you’re still using the bargain basement pots and pans you bought in college, Prime Day’s a great opportunity to fix that with an extra 25% off three different cookware sets from Cuisinart. Note: Discounts shown at checkout. This set features full tri-play contsruction, with an even-heating aluminum core encapsulated on all sides in durable and induction-ready stainless steel. $177 is an absurdly good deal for this level of cookware. This set is cheaper and includes more pots and pans, but the aluminum core is only on the base, and doesn’t extend up the sidewalls. It won’t make a huge difference in your cooking, but it does mean you’ll have a lot more temperature variance on the sides of the pan. Still, $120 is a stellar deal for a 17 piece set. If you really want nonstick pans, this set is a good deal at $126. Just make peace with the fact that nonstick pans won’t last as long, and won’t achieve the same crispy fond on food that you can get with a steel pan. Rarely under $400, you can buy this professional grade Vitamix 5200 for just $298 today. Our readers listed this blender as one of their favorites because it’s nearly impossible to break and has the horsepower to cut through pretty much anything you throw in there. This is the lowest price we’ve ever seen so if you’ve ever thought about getting one, today is probably the best day to do it. Looking for something a little cheaper but just as powerful, you can get this Vitamix Explorian is just $190 right now, as long as you don’t mind getting a refurbished. Don’t get burned by missing these sales on Zippo’s windproof lighters. This classic chrome lighter is the cheapest, just $8 right now. If you like inky matte colors, this black one is just $10 after the 20% off coupon, and this candle lighter is also just $10. Even fuel is on sale today - this 12 oz bottle is just $5. You need laundry detergent, dishwasher tabs, and Febreeze anyway, so you might as well buy $60 worth of it from Amazon today, and get $20 off at checkout. The selection is fairly limited, but they’re all consumables, so just stock up to save; you’ll use them eventually.